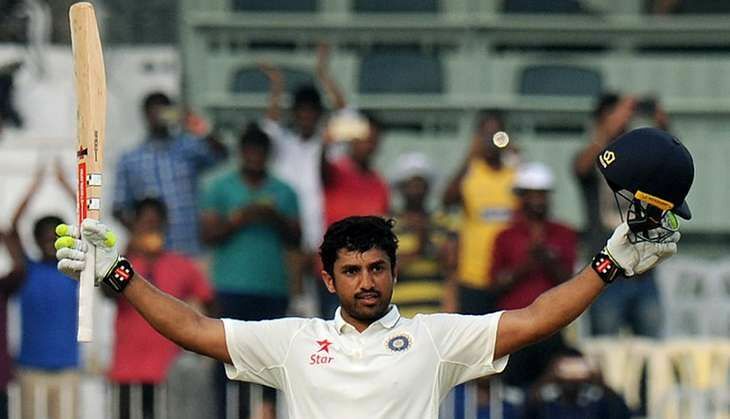 Virat Kohli's hunger for success stopped Jodhpur-born Keralite Karun Nair from breaking Virender Sehwag's record of the highest Test score by an Indian. India declared their first innings in the Chennai Test 759/7 - making it their highest ever Test score - with Nair not out on 303. Nair didn't bring up his triple century with a six, like Sehwag did in Multan in April 2004, but with a four. He did, unlike Sehwag, become only the third player in history - the other two being Sir Garfield Sobers against Pakistan in 1958 and Bob Simpson against England in 1964 - to convert his maiden Test century into a triple. On a lifeless pitch in Chennai, England thought they had the advantage on Day 3 of the fifth Test match when KL Rahul got out one run short of his first double century, just before the end of play. But if you thought Karnataka teammate Rahul's innings was epic, Nair's was heroic. Nair joins an illustrious list of 25 other triple-centurions, including Don Bradman, Brian Lara and some of the greatest to ever play the game - a list that includes only Sehwag from India. As with all other knocks of such magnitude, luck played a crucial factor. He was first dropped on 34 by none other than England captain Alastair Cook off the bowling of Jake Ball. While on 154, he mishit a reverse-sweep off Adil Rashid and was caught behind by keeper Jonny Bairstow. Ultra edge suggested the ball had deflected off the bat, but the umpire gave him not out and by that point, England had zero reviews left. Then, on Monday, Joe Root dropped Nair when he was on 217. Ball was the unfortunate bowler once again. Finally, Bairstow missed a stumping with Nair on 246. From then on, there was no stopping Nair, as he scored a scorching 57 off the next 39 balls he faced. Upon reaching his maiden triple-century, captain Kohli called his men in as India finally declared. "Best knock I've played in my life. Many situations in the middle when I had to play differently, with Rahul, Ashwin and Jaddu. I have to thank them for supporting me, egging me on. The first hundred is always important and I think when I got the first hundred, I didn't feel any pressure. I was just playing my shots after that," Nair said after his knock. "The message was to attack in the third session. We had a set overs to declare on, but when I got closer to 300, they pushed it back. I'm thankful to the team management." Nair is not the sort of child prodigy that are a dime-a-dozen in India's playgrounds. In fact, he was another left-field pick by the now-defunct Rajasthan Royals franchise in the Indian Premier League, but really started to come into his own under the tutelage of team mentor and one of India's finest batsmen ever, Rahul Dravid. Even his entry into the national side was down to luck - a couple of days short of his 25th birthday, Nair got his debut in the third Test match of the ongoing series against England at Mohali, thanks to KL Rahul's injury. But luck was not on his side. First, he was run-out by a poor call from Kohli and some great fielding from Jos Buttler. Then, in his second Test in Mumbai, Nair was LBW cheaply after a review. Two matches, two innings and an average of just 8.5. To add to his woes, during the fourth Test at the Wankhede Stadium, he dropped centurion Keaton Jennings before he had even gotten off the mark. Prior to this, Nair had managed a paltry 38 runs in four innings during India A's tour of Australia and before that, he survived a capsized boat in Kerala, where he had gone to make offerings after his ODI debut against Zimbabwe. His relatives, unfortunately, weren't so lucky, and perished in the accident. But once again, his luck turned, with Ajinkya Rahane's injury. In just his third Test innings, Nair smashed his way into the record books. Nair, a baby born prematurely, finally had his moment in the sun - that too, in the presence of his mother, who was watching her first ever live cricket match. - Nair is the quickest to score a triple-century in Tests. He did it in his third innings. Len Hutton had done it in his ninth innings. - Nair's knock is the highest by an individual against England. He bettered Kohli's 235. - Nair is the sixth youngest batsman overall, and the youngest Indian, to register a triple-century in Test cricket. - Nair is the fourth batsman to have scored a triple-century from No.5. No one has scored a triple century from No.6 or lower. - Sehwag scored his first triple ton against Pakistan in Multan in 2004, and then went 10 runs better (319) against South Africa at the MA Chidambaram Stadium in Chennai. Nair also scored his triple at the latter ground, albeit after it had been majorly revamped. - Nair actually scored his third century off just 75 balls - showing that he's a free-scoring player who can adapt his game according to the format and the needs of the team. With Australia touring India next, the selectors will have quite a job on their hands. Rohit Sharma and Ajinkya Rahane are set to come back from injury, and thus deciding who to drop, will be quite a challenge. However, the man with the triple century would be really unlucky to be axed anytime soon. With Dravid's influence and his own perseverance, Nair has made it through the rough patches. He has an abundance of time on his side, and with the right amount of hard work and the captain's backing, the sky's the limit. Sahil is a correspondent at Catch. A gadget freak, he loves offering free tech support to family and friends. He studied at Sarah Lawrence College, New York and worked previously for Scroll. He selectively boycotts fast food chains, worries about Arsenal, and travels whenever and wherever he can. Sahil is an unapologetic foodie and a film aficionado.